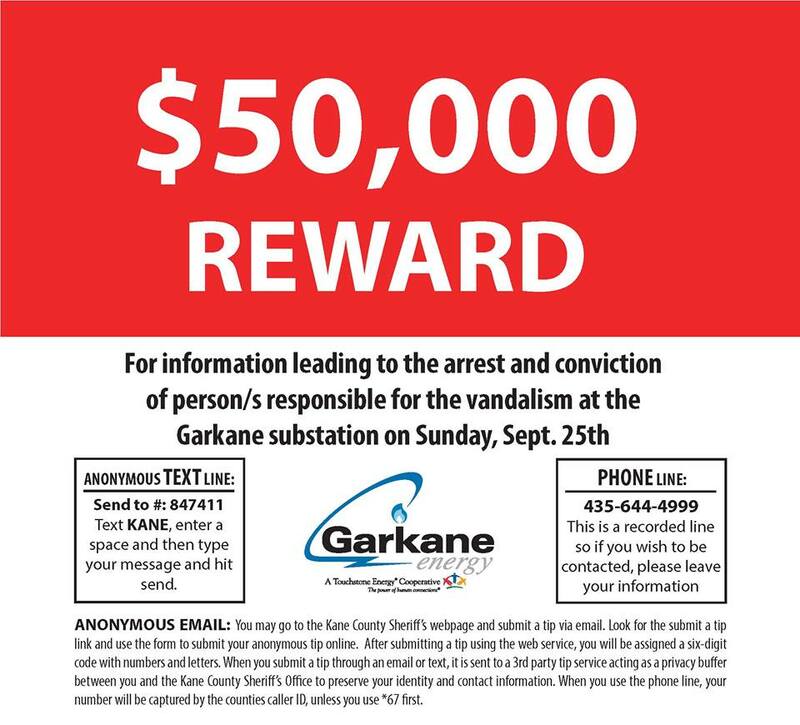 ST. GEORGE — Garkane Power in Kane County announced Wednesday they are offering a reward of $50,000 for information leading to the arrest and conviction of the person or persons responsible for vandalizing a power transformer station by shooting a high-powered rifle at it. There are two ways to submit an anonymous tip to authorities. A tipster could text an anonymous text service, or submit an anonymous e-mail. A phone line is also available, but anonymity might not be available. See the attached flyer for instructions on how to submit a tip. You may click on the picture to display it full size. 50.000 smackaroos ? That’s a lot of Coke and Cheetos ! Is it really too far-fetched to consider that it could be a terrorist act? Remember when the dems kept telling us that “there is no terrorist threat”? Remember when people thought that no one would ever weaponize a pressure cooker? Remember when New Yorker’s thought that no one would ever make IED’s on American soil? Is it too difficult to consider that it could have been a ‘training exercise’? They now know how vulnerable the transformers are. They now know the response times to detect the damage. They now know the projected length of time to repair one. They now know that time will multiply with multiple targets hit. It could ave been ‘hillbillies’ just as much as it could have been a ‘radicalized’ refugee. You do know that they are imported and shipped all over the country, right? Yes, even here in Utah. i wouldn’t be at all surprised if obama and crew are bringing in known radicalized muslims. The terrorist incidents help them advance their agenda of a security state, and we lose more rights and freedoms. Some utilities will spend the money to enclose substations with a tall block wall to protect capital equipment and any foolish enough to ‘wander’ too close. Please, oh, please, could the offender(s) blab to me. I could really use $50,000. With 50.000 somalians I could send a care package of Coke and Cheetos to Ladybug ♡♡♡♡♡ Praise the Lord ! With 50,000 somalians you could take over….Somalia! Care package???? How about a truckload?